I love making soft bangle bracelets! 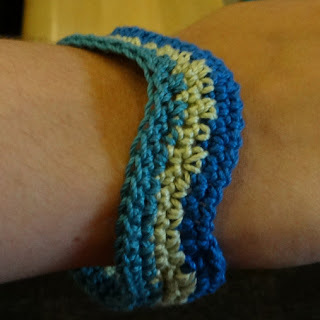 This one is really easy and uses increases and decreases in single crochets to create a softly wavy pattern that looks great in oceany colors. I used Aunt Lydia's Fashion Crochet Cotton in Blue Hawaii, Lime and Soft Teal. To work a decrease- insert hook first stitch, yarn over and pull through the stitch leaving 2 loops on the hook, insert hook in next stitch, yarn over, pull through the stitch, yarn over, pull through all the loops on the hook. You only need a small amount of each color. Chain 48, slip stitch to join being careful not to twist the chain. Round 1: ch 1, (doesn't count as first stitch here or throughout) sc in each st around, sl st to first sc to join. Make sure you have 48 stitches. Round 2: Repeat round 1, break of yarn. Round 3: Join in second color, ch 1, sc in first st, dec sc in next st, sc in next st, dec sc in next st, sc in next st, dec sc in next st, sc in next st, dec sc in next st, 2 sc in each of next 4 sts, *sc in next st, dec sc in next st, sc in next st, dec sc in next st, sc in next st, dec sc in next st, sc in next st, dec sc in next st, 2 sc in each of next 4 sts,* repeat **, sl st in first sc to join. Round 4: ch 1, sc in each st around. Break off thread. Round 5: join in new color, ch 1. dec sc over first and second sts, dec sc over next 2 sts, dec sc over next 2 sts, dec sc over next 2 sts, sc in next st, 2 sc in next st, sc in next st, 2 sc in next st, sc in next st, 2 sc in next st, sc in next st, 2 sc in next st, *dec sc over next 2 sts, dec sc over next 2 sts, dec sc over next 2 sts, dec sc over next 2 sts, sc in next st, 2 sc in next st, sc in next st, 2 sc in next st, sc in next st, 2 sc in next st, sc in next st, 2 sc in next st,* repeat **, sl st to first sc to join. Round 6: ch 1, sc in each st around. sl st to join, break off thead and weave in all ends with the tapestry needle. I love how this turned out, and it's so simple and quick. I hope you enjoy it too!